The Mitrailleuse was one of the first pseudo-machine guns – the first ones were developed prior to the Gattling, but they continued to be purchased by military forces through the 1870s. There were several versions, the two most common being the Reffye and Montigny designs. We are taking a look at the Montigny today, which used a cluster of 37 barrels, each chambered for a 10-12mm caliber cartridge (the specific cartridge would depend on the request of the buyer). The Montigny used a removable cartridge plate for loading, which allowed it to maintain a very high rate of fire (as long as loaded plates were available to the gunners). The breech was a large block containing 37 separate firing pins, which the cartridge plate attached to the front of. A large lever at the rear of the gun connected to a knee-joint type cam that would push the breechblock forward, chambering the 37 cartridges and locking the breechblock in place. 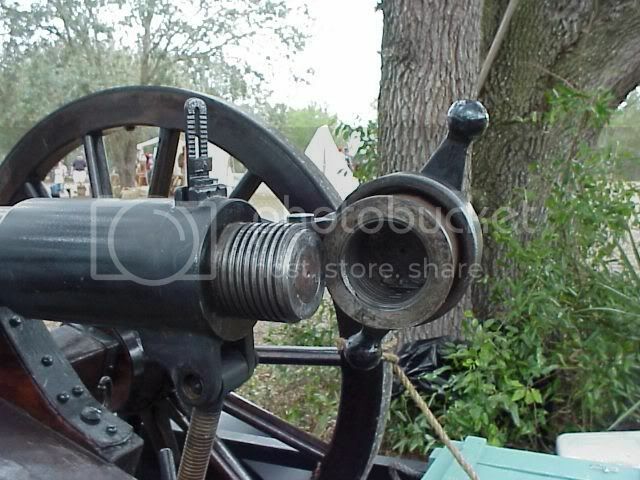 A second lever on the side of the gun would then be pulled up vertically, firing the barrels in succession. The firing mechanism was quite simple. When the breechblock was pulled rearward, all of the firing pins would be cocked against their own individual springs, and a plate would slide up between the firing pin and its port in the front of the breechblock. The firing lever simply pulled that bloacking plate downward, allowing the firing pins to snap forward against their cartridges in sequence. The rate of fire would be determined by the speed with which the firing lever was pulled, and could be as slow as single shots if the gunner was careful. Once the cartridges had all been fired, the rear lever would be used to unlock the breech and pull it backwards. The cartridge plate (now full of empty cases) would be pulled out the top of the gun, and a fresh loaded one put in its place. This sequence would be repeated as desired until the gun overheated or ammunition ran out. The Mitrailleuse as a general type of firearm saw only one major combat usage, and that was the Franco-Prussian War of 1870-1871. The French had adopted the Reffye Mitrailleuse (which had 25 barrels, and a screw-type locking mechanism instead of Montigny’s knee joint, but were otherwise similar for practical purposes) and considered it a game-changer. Unfortunately for the French, the tactical understanding of how to use a weapon like the Mitrailleuse was still totally lacking. The guns were treated like artillery, and used to fire at ranges of 1500m or more against German troops. The sights on the Mitrailleuse were simple post and notch affairs like rifles of the day, and the extreme range called required excellent range estimation (which the gunners were not trained for). To compound the problem, the combination of long range and small projectiles made it nearly impossible to observe point of impact when firing, and it was nearly impossible to actually hit targets as a result. The problems with French use of the Mitrailleuse were compounded by the secrecy surrounding the guns. The Army was so focused on preventing the Germans from discovering the guns that virtually no training was given to troops on their use – few had even seen them prior to battle. As a result of their utter failure to provide the French Army with an advantage, a general feeling of the inferiority of all such rapid-fire rifle-caliber weapons would permeate military culture for several decades. Ultimately, it was only the use of Maxim guns in WWI that would change the minds of generals and ordnance departments worldwide (although the forward-looking few did learn from conflicts like the Russo-Japanese War). Heh, you said Ludicrous Gibs! “get a mop!” – Hey, as a recovering Navy (M-14 and 1911 era) issue swabbie, I resemble that remark! This is unbelievably high-tech for its time; very elegant and clean. It is convincing testimony of metallurgy and machine-building capabilities of middle 19 century. French were always good at that even away from guns. How generals were able to use it in their favour is quite separate story. The 1870-71 war was as a result swift victory for Germans. Oh yeah… and we would almost forget: there was one already in 1718 – James Puckle’s gun. Original is in London’s Tower but many other replicas were made by enthusiasts. This was true ‘cranker’ with one specific and distinct advantage. It could use either round or square shots. The former were to be used primarily on fellow Christians, latter on Turks to teach tem benefits of allegedly superior civilisation. A racist gun, basically. Not understanding the proper use of a “new weapon” has apparently been a problem with military leadership since the beginning of warfare. And is seems that the leader that does figure it out was someone who wasn’t ‘doing well’ in the military or had no military training. Normal military structure favors those who blindly obey. Then the leader that did figure it out goes down in history as a great general/leader. The US Civil war has few of these from both sides. You are quite correct, Martin. A close examination of history and its countless ironies and twists of fate would reveal that many ( not all ) of those who have been credited with “figuring it out” either did so after someone else already had it worked out ( but who was ignored due to any combination of factors ), plagiarized that someone else’s ideas, or were incorrectly credited by historians. This applies to every period in history and to all categories of human endeavour, not just those associated with weapons and firearms. Another problem with the “secret weapon” thing was that as with the M1897 75mm field gun, the French army trumpeted far and wide that they had a “secret weapon” that was absolutely devastating in its effects. The other chancelleries in Europe noticed, as the French intended they should. Trouble is, the other chancelleries didn’t react quite as the French hoped they would. Most obviously, the Prussians. Having been thoroughly convinced of the weapon’s power (even if they didn’t know exactly what it was actually supposed to do anymore than the average poilu’ did), the Prussians dealt with the Mitrailleuse with typical Teutonic efficiency. I.E., when a unit of them showed up on the battlefield, it was immediately greeted with the heaviest artillery fire the Prussians could bring to bear on its location. And since the French didn’t employ it properly (as short range support), said Mitrailleuse unit could not reply effectively. Field guns generally outranging what were fundamentally rifle-caliber weapons, even then. The result, as you might expect, was that most such unis died without contributing much to the battles the were sent into. Except being target butts for Prussian cannon. That’s what I just said. Anyways, the Prussian high command (and tons of foreign military powers) had little respect for rapid-fire weapons at the time, and the failure of the Mitrailleuses overall made them think that machine guns were crap. Ordinary soldiers knew what would actually happen if a commander bunched his infantry together and charged a set of machine guns-instant slaughter. When Prussian artillery could not support its allied infantry, the French gunners had the advantage. More technical problems: Since the Mitrailleuse was treated as artillery, it had limited traverse (and slow elevation) and was too heavy to swing around. If the mount had been one with a free traverse and properly counterbalanced elevation control, I’m quite sure that the Mitrailleuse would have been more effective than on an artillery carriage. Any ideas? I’m guessing QCB’s was not an option. If you read up on the war of 1870, the main problem the French had was the short range of their artillery, by it the Mitrailleuse or standard cannons. The French still used timed shrapnel grenades with a maximum range of 2500 m, the Germans had impact fuses and could fire effectively up to 3500 m. What makes it very painful if you’re sitting in a 2 miles x 2 miles valley with 100,000 men and 500 artillery pieces are shooting at you from all around, like in Sedan. What was the war-tech used in U.S. at that time, for comparison? The Civil war is known to be time of quantum leap, specifically in artillery. Still the same muzzle-loading smoothbores and rifled muzzle-loaders used in the Civil War. The U.S. Army didn’t put great emphasis on rifled breech-loading field guns until the late 1880s. There were two main reasons. First, they had just won a war with the 12-pounder Napoleon and its kin. And second, the majority of the rifled breechloader designs available prior to about 1880 weren’t that strong and didn’t have reliable breech sealing. Both the Union and Confederate forces had used imported breechloading guns (British-made Armstrong and Whitworth guns for the most part) in the war, and had found that they weren’t really enough of an improvement over the muzzleloaders to be worth the expense. The biggest drawback being that while the BLs could generally be loaded a bit faster, without a recoil system to damp the “kick”, they had to be repositioned and relaid for each shot just like the MLs, which was the real factor that governed rate of fire at the time. The breechloaders only became really practical, and showed their true superiority in ROF, when recoil systems (spring, hydraulic, etc.) were developed; hence the term “Quick-Firing” or “QF” gun. Also, the breech mechanisms of the day weren’t really all that fast, unlike the later ones like the Krupp sliding block, the interrupted screw, etc. In fact, a trained and experienced crew with a Napoleon could fire (aimed) solid shot, shell or spherical case every thirty seconds (time to cut the fuse factored in), and canister once every fifteen seconds (the latter was a bit faster because it was loaded as a “fixed” round, powder bag attached to the canister’s bottom). Canister was a short range “self-defense” round, that basically turned the gun into a large-economy-sized shotgun. 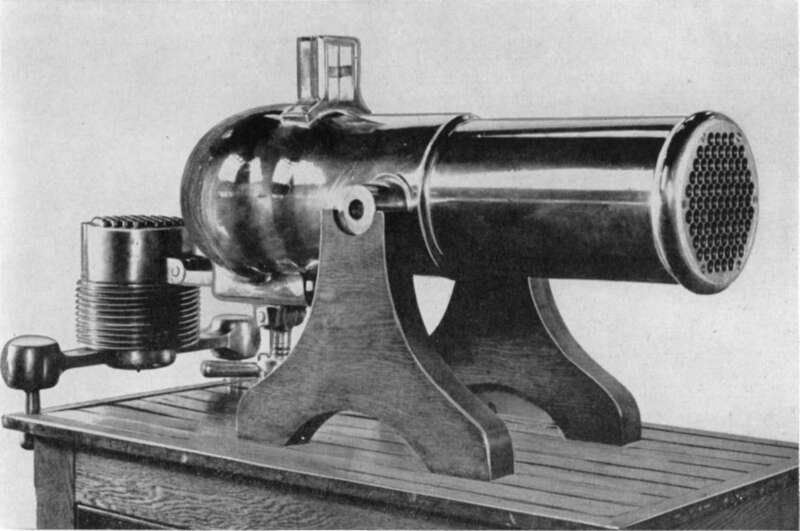 BTW, the 12-pounder Napoleon smoothbore (4.62″ bore, 66″ tube, all-up weight on carriage 2255 lbs.) had a maximum effective range of about 2000 yards, and a horizontal deviation from point of aim of 3 feet at 600 yards and 12 feet at 1200. This works out (in modern artillery terms) to under 2 mils and about 33 mils, respectively, which is pretty impressive for a gun with no rifling firing round shot. So much for the idea that smoothbore muzzleloaders were short-ranged and inaccurate. Even after the advent of the rifle musket, they still ruled to battlefield as long as they didn’t try anything fancy like charging up to Napoleonic (point blank) range against infantry on the defense. As long as the artillery was on the defense, they pretty much had things their own way. I also read some time ago about deBange obturator which was capable of effective breech closure. However it appears that development started in 1877 which would have been too late for both, the Franco-German and U.S.Civil war. I wonder what was the British pieces breech construction (Armstrong and Whitworth) at time they were available on NA continent. If used in Civil war, as you say, it must have been some other system. I recall seeing Whitworth costal gun in Fort McMurty in SC. It swung to one side on a hinge arbor much like that used on the pressure hatches on submarines in WW2. This is why it could be muzzle-loaded if you used something for a gas-check, either a disc of copper or brass or just a cut-of case-head. The tube was uniform for its full length inside. There were Whitworth muzzle-loading target rifles, as well, usually about .45 caliber. Equipped with telescopic sights, they were used as sniper rifles by both sides. The shell, with a lead driving band, was rammed in through the hollow screw, followed by the bagged charge. 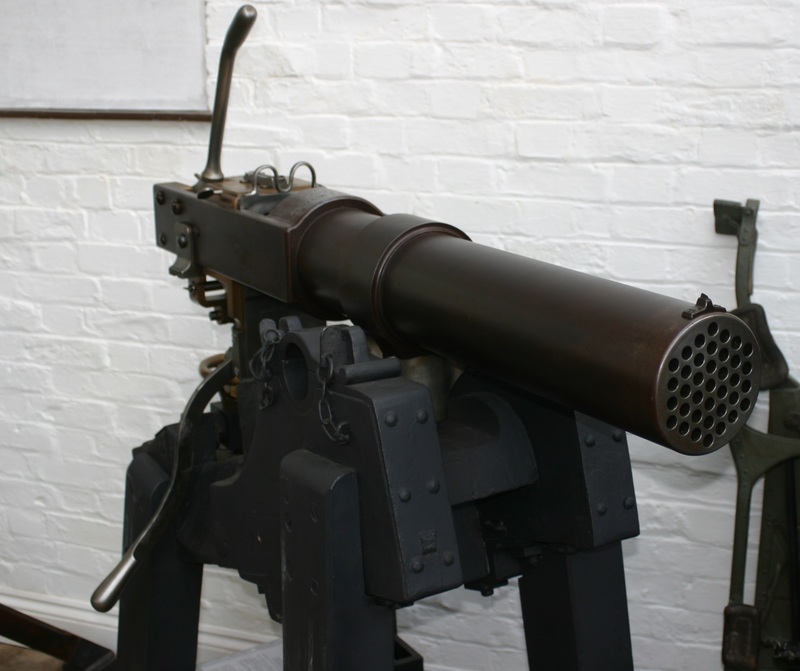 The Armstrong could not be muzzle-loaded, because the chamber was slightly larger than the bore and the driving band engaged the rifling in the leade just as later heavy guns’ shells do, even today. The Armstrong could have been modified to use a system like this with a blowout disc behind the bagged charge. The venturi could have been made by careful shaping of the breech-screw “tunnel”. Recoilless rifles in the American Civil War? To say that might have changed the history of artillery would be an understatement. Very interesting “eon”, thank you very much! This was the missing piece in my knowledge (well, there may be more…). I enjoy this part of history of artillery development and as you say, it was crucial in determining of new directions. I look at artillery piece as a rifle with more of power and fancier features. Oh, and Andrew, Wilhelm II never saw a Mitrailleuse in action, he was born in 1859. The crown prince in that war was Friedrich Wilhelm, his father (who died 3 months after taking office, so he’s often overlooked). I wonder about the cost of production of this gun. When it have fewer moving parts that manually cranked firearm it have 37 bores i.e. you must make 37 aligned bores and make the rifles insides it – the crank-operated has fewer barrels depending on models from 1 or 2 to 10 (Nordenfelt) – I wonder which is cheaper – fewer barrels and more complicated mechanism or inversely. When compared to crank-operated firearms the Montigny have a advantage, as is poor-ammunition-proof – it will don’t stop firing due to bulged case or breaked rim unlike the crank-repeater. When not big issue nowadays it can be considered seriously in their era – for example early British .577/450 Martini-Henry was made from rolled foil which causes the jamming of rifles. I wonder what the failure rate was while manufacturing the barrel? I can just imagine the language when the drill choked up with chips and broke off as the last barrel in the cluster was half way through. It varied. The Montigny and De Reffye model did indeed have the barrels made one at a time, then put together in a cluster inside a casing. was initially made by casting a cannon-like barrel “blank”, and then boring and rifling the barrels through it. Later versions adopted the “cluster of barrels” method, but kept the cannon “chase”-like outer appearance. BTW, the 85-barrel model shown in the first picture was used by the Confederates in the Civil War. Unlike the Mitrailleuse, the Vandenburg didn’t fire all its rounds at once; a crank in back turned a cam-operated set of strikers that fired the barrels in sequence, somehow. Give me a Gatling Gun any day of the week. Much less aggravation, all round. Check that link. Detailed information with excellent animation. I love that site. I wish they would finish up the rest of the sections on the Maxim and Browning guns. They say in text that Montigny gun was offered to Austria in 1869 and England in 1970 (just at time of war start-up!) It is hard to believe they were keeping it as a “secret” at the same time. There are some bars in uptown edge-of-Harlem New York City where for the last 50 years or so if you order a “French 75” you will get a cocktail glass that is half champagne and half congac. About as lethal as an artillery barrage. Brandy and bubbles…. Isnt this is same type of gun that been featured in Jango original series movie?? Looks very familiar there,except the movie version was belt loaded and also had many holes as this one.. The gun in Django, and a similar one in A Fistful of Dollars, are meant to look like the Mitrailleuse, but are only mockups. I’ve never seen Django, but I was just watching “Fistful” the other night, and I’m pretty sure the “mitrailleuse” was probably an Italian Breda M37 gas-operated HMG. The “firing” barrel was at the center of the “barrel cluster” (water jacket? ), as far as I could tell, so I don’t think it could have been either a British Vickers-Maxim or a German MG.08; then it would have been at the bottom. All three HMG’s receivers were about the same size, though, so who knows? Also, I’d suspect a Breda would have been easier for an Italian film company to scare up in 1964 than either of the other two. I was thinking at the time that making it a mockup of a Gardner two-barrel would have made more sense, as the Gardner looked a lot like a Breda, etc., except for that big crank on the side. Mitrailleuse cames frome ”mitraille”, wich en french means shrapnel shell, and I think it was a very good name for thus type of weapon. Last thing, the modern machine guns are still named ”mitrailleuse” in the french army. Czech and some others call it literally “balls-thrower”…)))) Kind like shrapnel. There were several mitrailleuse on display in the old colonial fort in Luanda, Angola. I didn’t think to ask at the time, whether they’d been taken around the country with patrols (presumably requiring ox carts or pack or dedicated pack animals)or whether they were for defending forts and sea ports. Come to think of it, I didn’t even think to ask whether they’d ever been used against humans. Just bought the new CIBLES (monthly gun magazine) here in france and it has a good article on the Reffye mitrailleuse by JULIEN LUCOT A paraphrase of the article says napoleon the third decided that france needed it’s own mitrailleuse The first designs were started in 1863 by the emperors aide de camp capitan de reffye. The first dvelopments were done at the centre de MEUDON In order to keep the project secret the emperor financed it from his own pocket.. The calibre was 13mm although cartriges up tp 16mm were experimented with.The emperor gave the go ahead on the arm by the 24th of may 1864 The first trials were done at VERSEILLES in 1868.These shooting trials were done at a distance of 1400 to 2000 metres on targets 210m long and 1.80 metres high which represented a army batalion. These trials were satisfactory. Hi all, I’m the writter for the article about French REFFYE in Cibles (French Magazine), Bobtail101, thanks a lot for your Post. Next month, the second article will be published with photo to the test wiht blank ammunition in the replica off the machine gun.